One of the most difficult challenges of associating virtual environments and real-world events deals with integrating real-world, tracked individuals into a virtual environment: while virtual individuals may interact with the avatars of real-world individuals, the latter obviously do not respond to the behaviour of the virtual individuals. To prevent collisions or unrealistic behaviour of either, one needs to ‘artificially’ modify the trajectory of the tracked individual. Moreover, after such modifications, one should end up returning that avatar back to the accurate representation of the real world. In this paper we propose a strategy for solving these problems based on generic control functions, which are flexible enough to be fine-tuned on a domain- dependent basis. Control functions determine an offset from the tracked individual’s actual trajectory and, when carefully parameterized, guarantee a smooth and automatic recovery after each trajectory modification. We discuss this approach, illustrate it with a variety of Gaussian control functions, analyze the believability of the resulting trajectory modifications, and conclude that control functions provide a sound and powerful basis for improving strategies of collision-avoiding trajectory modification and recovery. 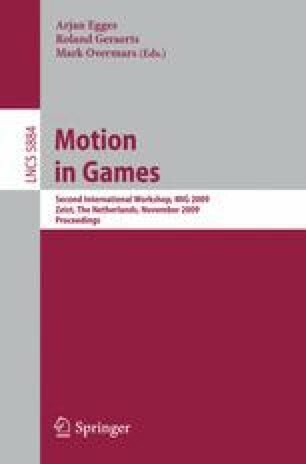 Most examples of domain-specific strategies discussed here are taken from the upcoming application area of real-time racing games, which provides both easily recognizable and very attractive situations, and has been the original motivation for this research.